I can’t thank you enough. You sent me over 300 translations since Saturday, and I’ve already implemented most of them! You should check your iGoogle homepage, and if it’s set to show your home language (at lest set it temporarily), you’ll see the change. I’d like to hear your comments on this. If you notice any misspellings or irregularities, be sure to notify me. Anyway, I hope this will make your user experience even better. We still need few languages though, but most of them are exotic so no need to rush. I’ll close the form and update those as well as soon as we receive them all. I’ve been so concentrated on the technical part of this website, I let the illusions fall in quality a little. Hope I make it up to you in the following days. I think it’s about time I hire someone with passion in optical illusions writing, with little WordPress experience. Having some additional writers, would definitely impact the article count. Think you’re perfect for this job? Apply, and if you prove yourself, you could be making something like 10 bucks per article just sitting and writing from home! But let’s move on to the illusions again. Elisha Bennett sent me this interesting photo recently. I have to admit I had this one on my hard drive for years, but somehow completely missed the point. You will quickly notice that the photo was simply rotated for 180 degrees, but it’s amazing how the shadows look 3D and that the square looks more natural in this version, then in the original. It’s almost as if we’re seeing actual parallel dimension, where people represent shadow’s shadow. Prev Let’s Translate The Illusion Widget! Nice, my igoogle page it is in Portuguese and it is the right translation. Love it. And i also like it this optical illusion. 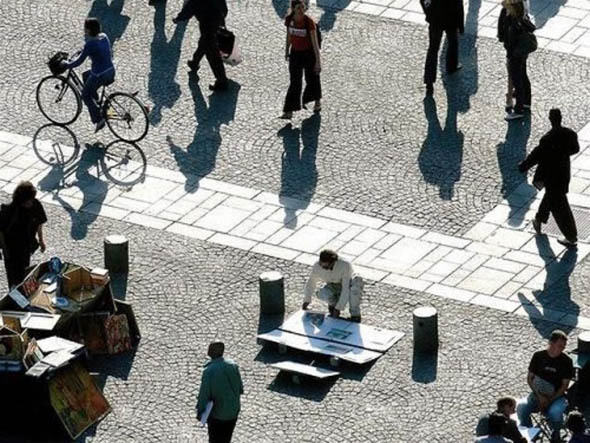 Without looking to the two last pics i thought the shadows were people but later i notice it was not because the rotation happens. Anyways, nice optcal illusion. Interesting! 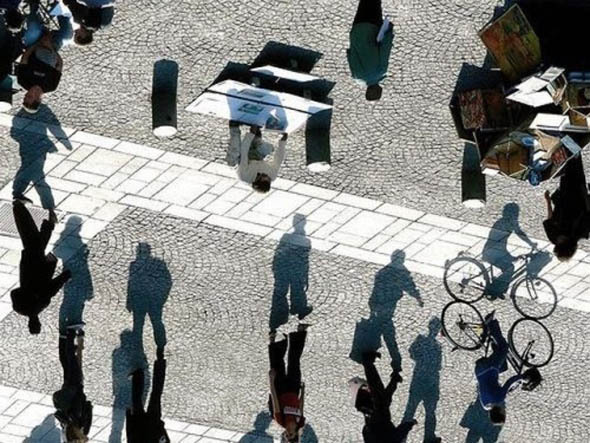 Shadows are good for illusions. It’s as if we’ve sunk below the ground and are looking up. That’s so cool :D !!!!! Lol, from the smaller view on the widget, I thought the shadows were the people and the people were the shadows! In the first picture, the little column or whatever you call it spoils the effect. Oh and BTW, you mispelled a word in the first paragraph: “…home language (at lest set it temporarily), you’ll see…”. What exactly does at lest mean? Now that would confuse the daylights out of Peter Pan. Good thing Wendy kept his shadow in a dresser drawer. i don’t know whether you have seen my analysis of illusions – and jokes and stories and games, which all share the same structure. May I commend it to your notice? — ‘Narrative, Perception, Language, and Faith’ (Basingstoke: Macmillan, 2005). I am a philosopher of perception. we’ve seen something like this before right? wasn’t it the zebra ones? It’s amazing what can be seen if you look at a lot of things from a different angle. Never would have guessed this was simply a matter of turning the photo upside down. And I do like to laugh at the posts about being first. I understand the page is moderated and post’s don’t appear at once, but others aren’t so bright. Good idea! The less you see the more you could imagine… That’s a human nature. Hello once again ! Not a bad illusion. Such a simple illusion, but still effective in getting our brains to think in a manner inconsistent with the normal everyday way that we’re trained to think. I also would like to throw my hat into the pile to “apply” for the job of narrator for the illusions, but i have no earthly idea as to where to begin! Please email me back friend with more information? I am just here for illusions NOT for the other stuff, please consider that, okay?